Jon Gruden’s name often is quick to the tongue of fans watching their teams suffer through coaching upheaval. The Browns chased him some last offseason, and at least Detroit and Houston have been mentioned as possibilities should Gruden want to return to the NFL ranks. But Gruden, currently ESPN’s Monday Night Football analyst, quickly quashed those rumors in an interview with the Pioneer Press. Who knows if Gruden would hold to those comments should a franchise come calling with an aggressive pitch. Gruden last coached in the NFL in 2008, his seventh season with Tampa Bay. He won the Super Bowl in his first year there, after moving over from Oakland. 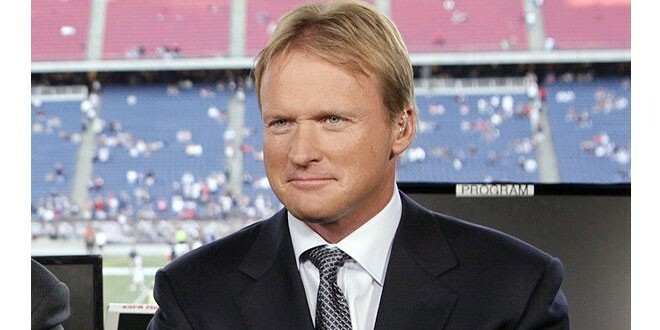 CBS’ Jason LaCanfora actually reported last week that Gruden could be “drawn to the possibility” of returning to Oakland. La Canfora also mentioned Atlanta as a landing spot that might intrigue Gruden. Neither of those jobs are currently open, with Dennis Allen still in position in Oakland and Mike Smith apparently set to return for the Falcons. Of the six openings that have become available (Tampa Bay, Houston, Detroit, Minnesota, Washington and Cleveland), the Buccaneers’ gig figures to be out considering that Gruden was fired by the current ownership group. Gruden’s possible financial demands could price him out of the picture for the others listed there. Gruden’s brother, Jay, may be in line for a head coaching job himself this offseason. He’s been the Bengals’ offensive coordinator for the past three seasons and was a Buccaneers assistant from 2002-08. Alberto Del Rio wins WWE Royal Rumble 2011!!! Gmail Momentarily Goes Down and Scares Everyone! Jennifer Lawrence is 'Like a Sister' for Josh Hutcherson, But He Still Loves Kissing her! Earth Hour 2012, Lights Off for 1 Hour! How to clean my home after construction work? Lindsay Lohan a Theif ?? Miracle Baby defeats meningitis and 7 heart attacks!